Could 2009 be the year that CDs finally make a profit? Could 2009 be the year that the Grateful Dead reunite for a tour? Could 2009 be the year that we finally get to hear the unreleased "Carnival of Light" sound collage by The Beatles? 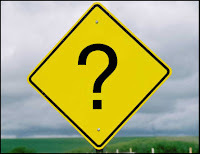 These are only a few of the many questions that this new year holds for us. Some of the more definite answers are that Bruce Springsteen will be releasing his 16th studio album just days before he headlines the Super Bowl half-time show February 1st. Also in February, Neil Young will hopefully be releasing his "decade in the making" Archives Vol. 1 box set. The box set contains rare and unreleased material from Neil Young's personal archives spanning the years 1963-1972. The month of March is highlighted by the release of the new U2 album entitled, "No Line On The Horizon" and by the reformation of Phish. Phish will play their first live show together since 2004. We can only hope that a full fledge tour will also be in the near future. Let's not forget, 2009 should bring new albums by the Dave Matthews Band, Wilco, Jay-Z, Eminem, 50 Cent, Tim McGraw, ZZ Top and possibly Kiss. Who will have the biggest selling album of 2009? As far as new music based video games, last year we had Guitar Hero: Aerosmith (which made the band a cool $25 million in sales), but in 2009 we will finally get Guitar Hero: Metallica. Fans will be able to play guitar and drums and even sing some of your all-time favorite Metallica songs in the courtesy of your own home. But, Rock Band does not want to be outdone by constantly providing full album downloads including Pearl Jam's debut "Ten". The big question is what to expect from the first video game to feature the music of The Beatles. All I know is that I want it. And speaking of Beatles, will 2009 be the year that the remastered versions of all of their original albums be released? 2009 is sounding like it's going to put a hole in my pocket, but hopefully the prices for these wonderful releases aren't outragous. We'll just have to wait and see what the answers are to these questions and more. As 2008 draws to a close, I would like to look back at the year of new releases. Some bands released their best album of the last 10 years, while other bands continue to improve upon each new album. Here I present my favorite albums of 2008. 1. Metallica - Death Magnetic: This is the album that Metallica fans have been waiting for since "And Justice For All". A return to their heavy metal roots. This album features some of the best music the band has made in almost 20 years. Producer Rick Rubin helped the band find their direction and reaffirm their identity as the premier heavy metal group. James Hetfield's voice and Kirk Hammett's guitar playing is the best it's been in years. The rhythm section of Lars Ulrich on drums and Rudy Trujillo on bass gives these songs the energy that has been lacking from prior albums. Every song on the album surpasses the five minute mark and allows the listeners to get involved in the songs. 2. 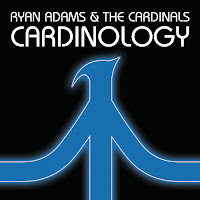 Ryan Adams & The Cardinals - Cardinology: Ryan Adams continues to make some of the best music of today. His song writing is second to none. This his 10th album in 8 years and his fourth with The Cardinals. 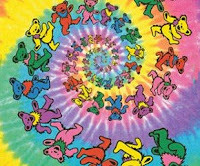 The album is dubbed as "alternative country", but finds similarity to the sounds of the Grateful Dead. A great album to relax and absorb. 3. 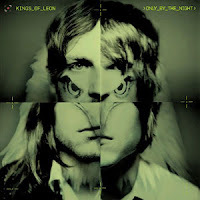 King Of Leon - Only By The Night: I know I've said it before, but this band keeps getting better with each album(this being their fourth). While the band has not taken off in the US as they have in other countries, their albums are some of the best albums made the last five years. This is the band's most successful album debuting at #5 and it also received 3 Grammy nominations for the band. Lead singer Caleb Followill's song writing and singing have improved as well as the band's instrumentation. 4. 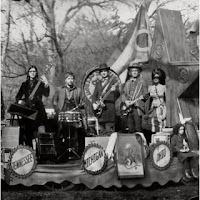 The Raconteurs - Counselors Of The Lonely: This is only the second album by this band led by the White Stripes' Jack White. The album was recorded, produced and released in a matter of weeks. The combination of Brendan Benson and Jack White on vocals and guitars are the best rock duo in music today. The album touches upon alternative rock, classic rock, country rock and blues. While their last album was only 30+ minutes long, this one more that makes up for it was its storied lyrics and unforgettable sound. 5. 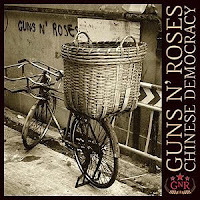 Guns 'N Roses - Chinese Democracy: It's the band's first album of new material in over 17 years. It also cost over 13 million dollars to make. On top of that, the album was sold exclusively through Best Buy. The album debuted at #3 in November and has since sold over 300,000 copies. The sound of the album ranges from Hard Rock to Blues to Orchestrated Ballads. With over a dozen different musicians on the album, the only constant is Axl Rose. It does feature some amazing song writing and performing as in the songs "Better" and "Madagascar". Was it worth the wait? No, but it is still one of the best albums of 2008. 6. 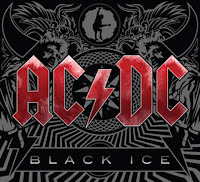 AC/DC - Black Ice: AC/DC returned in a big way. Their album "Black Ice" debuted at #1 selling over 700,000 copies in its first week of release. The band made a deal with Wal-Mart to sell the album exclusively which did not seem to hurt the sales at all. While first half of the album is as good as anything the band has ever recorded, the second half seems to lose some of its power. After 33 years together, AC/DC still know how to rock better than anyone. 7. 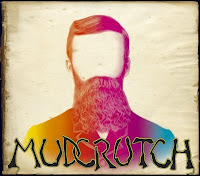 Mudcrutch - Mudcrutch: The band Mudcrutch was the name of Tom Petty's band before the formation of the Heartbreakers. Originally formed in 1970, the band released one single back in 1975 which failed to make the charts. After reviewing the documentary "Runnin' Down A Dream", Tom Petty decided to reform Mudcrutch and record an album. The album was a surprising success and the mini-tour was even more of a success. The fun of making this album is heard in the songs. This is how country rock albums should sound. 8. 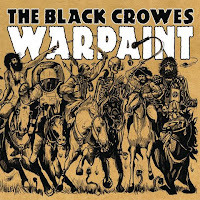 The Black Crowes - Warpaint: The band began recording this album in July 2007, after a 5 year layoff from each other. The Robinson brothers created some of their strongest work since their debut album. The Black Crowes brand of blues-rock is like nobody else. Songs like "Oh Josephine" and "Whoa Mule" help make this album a keeper. With very minimal overdubs, it makes the listener feel like their in the studio with the band. One of their best albums ever. 9. B.B. 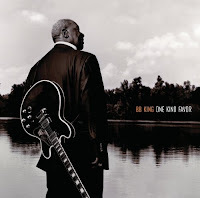 King - On Kind Favor: At 83 years old, B.B. King made one the the best albums of his career. With the help of producer T Bone Burnett, B.B. King took blues songs like, "See The My Grave Is Kept Clean" and "Blues Before Sunrise" and made them feel like brand-new originals. The album carries a very basic sound that allows B.B. King's guitar playing to become the focal point and breathes new life into this blues legend. 10. R.E.M. 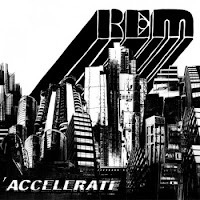 - Accelerate: This is R.E.M. 's best album in over a decade. It debuted at #2 back in April, but quickly fell off the radar. The album is only 35 minutes long and is a very up-tempo album without any long, drawn-out ballads. I hope the band continues in this same vein of music writing. 2008 was the seventh consecutive year for a drop in CD sales. With slow first half sales, not even some of the biggest names in rock music could save the format. Universal Music Group declared that digital music sales surpassed CD sales. Even vinyl music saw an increase in sales this year. So, is this the end of CDs? With a grim outlook, the coming years will be crucial if the compact disc expects to have an extended shelf life or not. This past year, I attended a good deal of concerts, some amazing shows that I'll never forget and maybe some I wish I could. I saw piano legends, guitar gods, pop idols, some hair metal and even a little bit a country. But, there were 2 shows that stood out more than the others. One show that impressed me was by former 80's hair metal band Motley Crue. Their tour, entitled "Crue Fest", was a full adrenaline rush provided high energy songs and enticing videos. Touring behind a brand new album, "Saints of Los Angeles", the group did a great job mixing in new and old songs. The stage, along with the fireworks and explosions, only added to the experience. The band, for the most part, looked to be in great shape as Vince Neil ran all over the stage, followed by Nikki Sixx passionate playing and Mick Mars amazing guitar licks. All being provoked by Tommy Lee's pounding drums and outgoing demur. It was a perfect show for a hot August night. 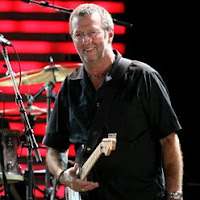 By far, my favorite show of the year was by legendary guitar god, Eric Clapton. Having only see Clapton one other time during his 1994 "blues" tour, this show displayed some of the most amazing guitar being played today. He performed many classic originals mixed with blues covers as he played both electric and acoustic guitar. His encore of "Got My Mojo Working", featuring opening act Robert Randolph, was one for the ages. A very professional classic rock show. Overall, the concert industry did very well this year despite fans' economic struggles. If the right performer comes around for the right price, be sure to get a ticket. It could be one of the best concerts of your life. As the first of only two New England area shows, country superstar Tim McGraw came and amazed the audience at the Mohegan Sun Arena. Backed by his regular band, The Dancehall Doctors, Tim McGraw was not there to promote an album, but just to perform for his fans. After these two shows, Tim McGraw will not perform live again until mid-2009. As his band took their places, Tim McGraw walked out onstage to a deafening roar from the audience. He began the evening with a new song entitled “Still”. Fans automatically accepted it as an old favorite. 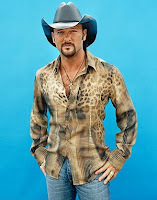 Tim McGraw proceeded to perform four of his Country Singles chart toppers, “Unbroken”, “Back When”, “Last Dollar (Fly Away)” and “Where The Green Grass Grows”. Tim McGraw was masterful in the way he covered the stage, performing for both the main audience and the audience located behind him. “Kristofferson”, a personal favorite from his latest album and the Ryan Adams’ original “When The Stars Go Blue” prepared the crowd for his biggest single of 2008, “Let It Go”. With a new album just waiting to be released, Tim McGraw proceeded to try out the new songs “Southern Voice” and the slow-tempo “You Had To Be There”. Getting the crowd up on their feet, he went back in time to one of his earliest singles “Indian Outlaw”. Keeping the crowd rockin’, Tim McGraw finished his set with “Between The River And Me”, “I Like It, I Love It” and one of his most popular songs “Live Like You Were Dying”. Tim McGraw walked off stage to an overwhelming standing ovation that seemed to drown out the sound of the band. The encore began with an acoustic version of his 2007 hit “If You’re Reading This”. The song takes its lyrics from a letter that a family received only upon the death of a soldier. Being in the Christmas Spirit, Tim McGraw performed the Skip Ewing original, “It Wasn’t His Child”. Tim McGraw and his band then proceeded to pick-up the tempo with fan favorites “How Bad Do You Want It” and “Something Like That” before ending with his 2003 hit single, “Real Good Man”. Knowing what to expect, the crowd was still left in awe by the performance given by this country superstar. “The hardest working band in country music”, The Lost Trailers opened the evening with “Hey Baby” from their 2008 album, “Holler Back”. With only a quick 30 minutes to play with, they performed their latest single, “How ‘Bout You Don’t” and a cover of John Mellencamp’s “Hurts So Good” among other songs. They finished their set with their Top Ten country hit “Holler Back”. Coming soon to Mohegan Sun is Daryl Hall & John Oates, Lynyrd Skynyrd and Aaron Lewis of Staind. Visit www.mohegansun.com for more information. The nominees of the 51st Annual Grammy Awards was announced Wednesday night. 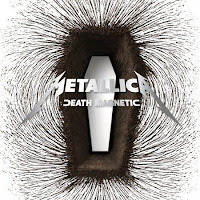 After looking through all 110 categories, there were some albums that were overlooked in certain categories (Metallica's Death Magnetic - Album of the Year). And some albums that were overlooked entirely (Neil Diamond, Black Crowes, R.E.M.). While the Best Solo Rock Vocal Performance Category has no losers (John Mayer, Paul McCartney, Bruce Springsteen, Eddie Vedder, Neil Young), the Best New Artist Category has no real winner. The Jonas Brothers already won. They've made more money than everybody else in that category combined. I especially enjoy seeing the elder statesmen like Bruce Springsteen, Neil Young and James Taylor competing against newer acts like Kings of Leon and even Radiohead. But no matter who wins the Grammy Award, if your album gets nominated for a Grammy, then you are almost guaranteed to double the sales of that album. For a complete list of all 110 categories, go to www.grammys.com. Many of us have the same Christmas songs we love to hear over and over again by our favorite artists. Songs like "White Christmas" by Bing Crosby, "The Christmas Song" by Nat King Cole and "Blue Christmas" by Elvis Presley are just a few of these songs. 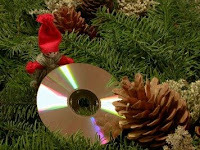 This holiday season, we find an over abundance of new Christmas CDs by some of the biggest names in the music industry. The standard artists associated with Christmas like Elvis Presley, Tony Bennett, and Harry Connick Jr. have released new Christmas CDs, while Melissa Etheridge, Faith Hill, Los Lonely Boys and Bela Fleck are releasing their first batch of holiday classics. This Christmas has a bunch of established artists taking that musical plunge into the holiday CD section. First up are the ladies, Grammy-winner Mary Chapin Carpenter released her first holiday CD entitled, "Come Darkness, Come Light". Melissa Etheridge "A New Thought For Christmas" features classic Christmas songs mixed with some holiday originals. Country superstar Faith Hill has released an album called "Joy To The World", of 10 traditional Christmas songs, plus 1 original composition. Living legend Aretha Franklin has released a Borders Store exclusive Christmas CD entitled "This Christmas Aretha". Another exclusive Christmas album is by Grammy-winner Sheryl Crow. Her Hallmark Store exclusive CD "Home For Christmas" collects 9 traditional songs with one new holiday original. As for the guys, Christmas crooner Tony Bennett has a new CD of holiday favorites performed with the Count Basie Orchestra. Another Christmas crooner, Harry Connick Jr. released his third Christmas CD entitled "What A Night! A Christmas Album". It has almost become a tradition for Harry Connick Jr. to relase a new Christmas CD. A couple of newcomers to the Christmas scene are Bela Fleck and The Flecktones with "Jingle All The Way" and Los Lonely Boys with "Christmas Spirit". But, one of the biggest releases this holiday season is by the legendary Elvis Presley. His newest Christmas CD is entitled "Christmas Duets" and features the king performing holiday favorites with some of today's ladies of country like Carrie Underwood and Gretchen Wilson using today's technology. If you would rather have a mix of holiday classics by different artists, then "The Essential Now! That's What I Call Christmas" is what you're looking for. It features 25 of some of the most popular holiday favorites. For the Classic Rock fan, Hip-O Records has released a CD of 14 songs performed by classic rock artists, Lynyrd Skynyrd, Styx, Elton John and more. One of my personal favorite Christmas artists, Brian Setzer, has released a greatest hits collection of his 2 previous Christmas albums. The new CD entitled "Christmas Rocks" contains 20 songs and can also be found with an accompanying DVD featuring his annual live Christmas Show. So, let's all gather around the ol' iPod and take in some Christmas cheer provided by holiday tunes both new and old. Rock legends, The Who, made one of only ten stops on their North American leg of their 2008 tour at the Mohegan Sun Arena on Tuesday evening. With only two remaining original members, what was one to expect from a band that started out in 1964? Well, when the two remaining members are lead singer Roger Daltrey and guitarist Pete Townshend, you can expect a classic rock show like no other. As Pete Townshend said, "You drink, you gamble, you come and see The Who" and that's exactly what the sold-out crowd did. The Who walked out onstage to a standing ovation before playing one note of music. As Pete Townshend and Roger Daltrey felt humbled by the applause, Pete started with the guitar intro to The Who's 1965 classic "I Can't Explain". Roger's mic swinging started early as a video montage of the band's history shown in the background. Pete Townshend's signature windmill guitar strumming didn't appear until the evening's third song, "Relay". One of the band's newest songs, "Fragments" held the audience's interest before the band broke into the crowd pleaser "Who Are You". With the audience up on their feet, they sang along with Roger Daltrey to the 1971 classic "Behind Blue Eyes". Roger's intro to "Real Good Looking Boy" explained that without "The King", rock n' roll would not be what it is today and the band proceeded to play their tribute to Elvis Presley. After the rare "Sister Disco" from the "Who Are You" album, the keyboard intro to "Baba O'Riley" blew the roof off the arena with the audience singing along to the chorus. Pete Townshend took over the lead vocals, performing the band's 1982 hit "Eminence Front". Next came two classics from the "Quadrophenia" concept album, a rockin' version of "5.15" and the thunderous "Love Reign O'er Me" which had Roger screaming out the chorus. "My Generation" found the audience playing "air guitar" while bassist Pino Palladino had his spotlight solo. The band closed their set with the crowd pleaser "Won't Get Fooled Again" which featured a solo by keyboardist, John "Rabbit" Bundrick. Even though the audience sang along to the chorus, nobody could outdo Roger's vocal performance. Chants of "Who, Who, Who" brought the band back to the stage performing a medley of songs from their 1969 rock opera "Tommy". Pete Townshend's guitar intro for "Pinball Wizard" started an "Amazing Journey" of sight and sound before finishing with the fan favorite "See Me, Feel Me/Listening To You". As the band exited the stage, the heart and soul of The Who stood alone onstage before a standing ovation. Roger and Pete finished the evening with an acoustic version of "Tea And Theatre" from their mini-rock opera, "Wire And Glass". Not knowing when or if The Who will ever tour again, their fans absorbed every last moment. Newcomers, Inward Eye, began the evening with an energetic 30-minute set. The trio played a set of punk rock originals. They mentioned how they used to listen to their parents Who albums and how excited they were to be opening for one of their rock idols. Upcoming shows at the Mohegan Sun Arena feature Staind with Papa Roach, Smashing Pumpkins 20th Anniversary Tour, Tim McGraw's only New England Appearance and two nights with the legendary Elton John. The rain and winds were blowing hard outside while Tesla was heating up the audience inside the Webster Theatre, Saturday Night. Tesla is currently touring behind a brand-new album entitled "Forever More". With the stage set, the intro music rang through the speakers. As the band took the stage, guitarist Frank Hannon played the first notes from his white "Flying V" guitar. The band kicked off their show with two new songs including the band's latest single, "I Wanna Live". Lead singer Jeff Keith stated before "Modern Day Cowboy" that this song was for "all the diehards" in the audience as they sang along with him. The band stayed with their 1996 debut album performing the song "Getting Better". The front row received "high fives" from singer Jeff Keith as the band tore into "Heaven's Trail (No Way Out)" and "The Way It Is", both from their double-platnium album "Great Radio Controversy". Jumping from 1989 to 2008, Tesla played it's new "arena rocker" song, "So What" from their "Forever More" album. As two acoustic guitars were broght to center stage, guitarist Frank Hannon and Dave Rude played an acoustic jam. Then the crowd went wild as they heard the familar intro to "Love Song", Tesla's biggest selling single. Next came a surprise, the rarely played "Try So Hard" from their 1994 album "Bust A Nut" had long-time fans singing along. Guitarist Frank Hannon sported an "Uncle Sam" hat as the band jammed before leading into their cover of Five Man Electrical Band's "Signs". The energy and volume were turned to the max as the band finished their set with "Edison's Medicine", "Lil' Suzie" and the fan favorite "Comin' Atcha Live". As the band returned to the stage, singer Jeff Keith sported an Oakland Raiders jacket provoking "boos" from the audience. Tesla began their encore with a new track called "All Of Me". As the audience chanted for "one more", Brian Wheat's bass line brought in the evening's final song, "Hang Tough", showing much love to their faithful audience. Pop Evil, from Grand Rapids, Michigan, opened the evening with a 45-minute set. Starting off with the song "Ready Or Not" from their 2008 release "Lipstick On The Mirror". While the majority of their songs came from their new album, Pop Evil also played a brand-new song called "Rolling Stone". As they won the audience over, they finished with their newest single, "Hero". Golden Bloom is the brainchild of Shawn Fogel, a musical chameleon of sorts. Shawn Fogel has performed solo with musical peers Guster, Ben Lee, Adam Green (of Moldy Peaches), Thurston Moore (of Sonic Youth) and others. He also partakes in a number of other bands, but his newest band Golden Bloom will be releasing their debut album in early 2009. The songs (on the 3-track preview) range from alternative rock to classic folk. The song "The Fight at the End of the Tunnel" sounds like recent Red Hot Chili Peppers. A slow beat that gets taken over by guitars as Shawn performs his best Anthony Kedis impression. "Doomsday Devices" sounds like a modern rock pop songwhich is as good as anything on today's radio. "The Mountainside Says" has a folkie, sing-a-long type vibe to the song. It brings in aspects of Neil Young to the song's lyrics. Shawn Fogel performs everything from piano to guitar, bass, tenor sax, keyboards, drums or whatever the song calls for. Shawn Fogel will be appearing at Two Boots in Bridgeport on Saturday, November 1st. Check out Golden Bloom's video for "Doomsday Devices" at http://www.youtube.com/watch?v=S7j7jL-XOSU. 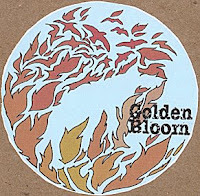 For more information on Shawn Fogel and Golden Bloom, please visit goldenbloom.net. 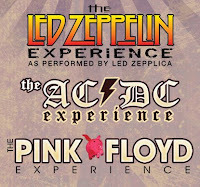 What are the chances that AC/DC, Pink Floyd, and Led Zeppelin would perform together on the same stage? Probably ZERO! However, their tribute bands did just that as The Classic Rock Experience was on display Monday night at the Chevrolet Theater. On the bill was Back In Black (AC/DC Tribute Band), The Pink Floyd Experience, and Led Zeppelica. The evening started with the AC/DC tribute band, Back In Black. The guitarist replicated all of AC/DC guitarist Angus Young's mannerisms and style right down to the school boy outfit that is still worn by him today. The lead singer switched personalities between current AC/DC singer Brian Johnson and former lead singer Bon Scott. The only problem was that the volume of the vocals was too low, but if you knew the songs, it didn't matter. After a quick set change, The Pink Floyd Experience took the stage. The music was phenomenal, with one minor flaw, the lead singer was very distracting. Throughout the 45 minute performance, he had a guitar that he never seemed to play and performed the songs with hand gestures. As my buddy Jesse said it seemed too much like "American Idol". But the musicianship was spot on. The closing song from their set was "Comfortable Numb" which featured a remote controlled inflatable pig that flew over the crowd. The headliner of the evening was the Led Zeppelin tribute band Led Zeppelica. They were by far the best act of the night and in my opinion one of the best tribute bands around. The mannerisms, the singing, and the music was perfect. The highlight of their 90 minute set was an extended version of the Led Zeppelin hit, "Dazed And Confused". Led Zeppelin guitarist Jimmy Page would've been proud of the guitar solo that included his signature violin bow. Before the evening ended with an exceptional version of "Whole Lotta Love", the bands and crew sang "Happy Birthday" to their sound engineer. The night began with people playing air guitar in their seats to AC/DC and watching the Pink Floydian light show. The night ended with the audience on their feet singing and dancing along to Led Zeppelica before giving the band a standing ovation. 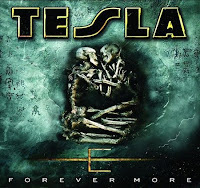 CD Review: Tesla Will Rock "Forever More"
Rock veterans, Tesla wasted no time recording their follow-up to last year's covers album "Real to Reel". After coming off a world tour, the band entered the studio right away with producer Terry Thomas to record the band's newest album "Forever More". It is their first album of original material in 4 years. An acoustic interlude gives way to a pounding drum beat and a screaming guitar before the band comes in full force on the album's opening track "Forever More". The overall sound of the album is a more grittier Tesla than their last original album. The band seems to have more power behind their playing as shown on the album's first single, "I Wanna Live". The band wastes no time or energy with the up tempo "One Day At A Time". "So What!" is the band's "arena rock" song that will have audiences singing along to the chorus when performed live. A couple of the more meaningful songs on the album are "Just In Case" and "Fallin' Apart". Lead singer Jeff Keith sings his heart out on these power ballads. The dual guitar attack of Frank Hannon and Dave Rude is heard throughout the album, highlighted by the song "Breakin' Free". "All Of Me" is a hard rocker with a "head-banging" tempo provided by drummer Troy Luccketta. "The First Time" is an upbeat, positive song about being "extraordinary". 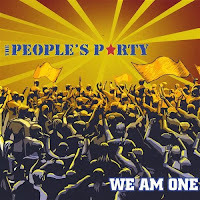 Tesla is not comfortable being a political band, but they do touch upon the war by paying a tribute to the troops and their loved ones in the song "Pvt. Ledbetter". "In A Hole Again" starts off slow, before the band comes in full force. It also features a great guitar solo by Frank Hannon, but it's Brian Wheat's bass playing and backup singing that gives the song it's power. The album ends with a heavy rocker that almost has Jeff Keith "rapping" through the lyrics on the song "The Game". Tesla is currently on a world tour in support of this new album. They will be performing Saturday, October 25 at the Webster Theatre in Hartford. The new album is called "Forever More" and is available online and in stores now. Check out www.teslatheband.com for more info on their new album and current tour. The band Pop Evil will be opening for Tesla on their current tour. They are promoting their new album "Lipstick On The Mirror". Their music is hard hitting with a hard rock sound and some hip-hop style lyrics thrown in here and there. Songs like "Hero" and "Breathe" are a couple of examples their heaviest songs with some great harmonies giving the song a more modern feel to them. Songs like "100 In A 55" and "Stepping Stone" both start mellow with a nice acoustic guitar before Leigh Kakaty take over the song and brings it into overdrive. Show up early and check out Pop Evil before rockin' out to Tesla. 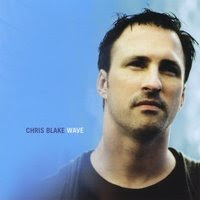 Musician Chris Blake has a new video on his myspace page for the song "Lullaby". The song is from his current album entitled "Wave". I feel that the song would play perfectly for one of today's drama shows on TV, like Grey's Anatomy or CSI. But the video for the song is just plain great. The use of the classic home video footage keeps your eyes glued to the screen. Plus, isn't this what we all dream about. About being a young, about being innocent, about being a kid again. Please do yourself a favor and check out his new video at www.myspace.com/chrisblakemusic. The New Jersey based band, Senses Fail, have released their newest album entitled, "Life Is Not A Waiting Room". Expectations are high for this release, since the band's last album, "Still Searching" debuted at #15 on the Billboard charts in 2006. While many bands try to expand by changing their sound, Senses Fail stays true to what works and sounds best. The new album starts with a slow, haunting guitar and bass line with a distant pounding drum. The melody of the lyrics in "Fireworks At Dawn" plays right along to the music, before leading into the "machine gun" like drumming of "Lungs Like Gallows" . Lead singer, James "Buddy" Nielsen, rips his vocal chords right through the chorus. The band sings about taking back some of the mistakes they've made in the song "Garden State". It's the power of the group's singing and harmonizing that makes "Family Tradition" such a catchy song with a powerful message. "Wolves At the Door" keeps the energy going with the guitar duo of Garrett Zablocki and Heath Saraceno highlighted by some amazing drumming by Dan Trapp. The songs "Hair of the Dog" and "Four Years" have the winning formula of a straight-forward hard rock hit song. "Ali for Cody" is a pure energy rocker with a perfect combination of bass and drums. The one slow-down song is "Yellow Angels". The lyrics are executed perfectly by James "Buddy" Nielsen as the song deals with giving more meaning to one's life. The songs "Chandelier" and "Map the Streets" bring the tempo roaring back again with the band's essential sound. The album closer, "Blackout" is about dealing with the loss of someone you've always expected to be there and has the band running on all cylinders. Every song on this album can stand on it's own as a hit single. Singer James "Buddy " Nielsen stated that "This is the most fun we've ever had as a band" and it certainly shows on this album. The band will be performing live at the Webster Theatre in Hartford on November 16th. The album is available now in stores and online. 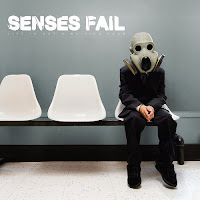 For more info, visit www.sensesfail.com. Will 2009 bring the return of the jambands? It appears so. The year 2009 seems to be shaping up into a great year for fans of the jambands. First off, 2009 will be the 40th anniversary of The Allman Brothers Band. This band has been quietly carrying the torch since the loss of Jerry Garcia disbanded the Grateful Dead. The Allmans have a full slate on their plate, starting with a run of live shows at the Beacon Theatre featuring specials guest performers. That will be followed by a tour and possibly a new studio album. Since 1995, the Grateful Dead have only played together a handful of times, but recently they reunited to support Barack Obama for president. They played a live show last Monday at Penn State University and have mentioned the possibility of doing a reunion tour. We'll have to keep our fingers crossed for that one. Let's not forget some of the biggest jamband news to come down the pike in a long time. The reformation of Phish. Phish announced earlier this month that they will be performing a few shows at the Hampton Coliseum in Virginia. This will be their first set of shows since 2004. These shows will be followed by a tour and hopeful a new album of sorts. Another band that is slowly climbing its way back into the jamband scene is Blues Traveler. After releasing one of their strongest albums in years, they are currently on tour and hope to continue performing into 2009. And, as long as bands like Umphrey's McGee, moe, Widespread Panic and others continue jamming, it looks like 2009 will be a year to remember. So, breakout your tie-dye shirts and try to catch a show near you. One of the most recognizable guitars in the world is the Gibson Les Paul. Guitar Gods such as Duane Allman (The Allman Brothers Band), Jeff Beck (The Yardbirds), Ace Frehley (Kiss), Billy Gibbons (ZZ Top), David Gilmour (Pink Floyd), Jimi Hendrix, Alex Lifson (Rush), Gary Moore (Thin Lizzy), Jimmy Page (Led Zeppelin), Keith Richards (Rolling Stones), Pete Townshend (the Who), and Joe Walsh (The Eagles)Ê have all used a signature Les Paul guitar at one point in their musical career. So, it is fitting that a CD has been recorded, paying tribute to the man behind this wonderfully popular musical instrument. The albums start with a couple rockin' blues songs featuring none other than 93 year old Les Paul on guitar. 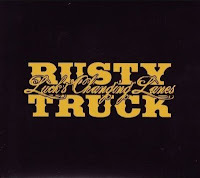 The first song, "The Good Luck You're Having" features a young blues master named Joe Bonamassa on vocals and guitar. Former "Late Night with David Letterman" guitarist Hiram Bullock performs vocals and guitar duties on "The Walls Came Tumbling Down". 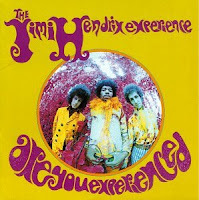 This would be his last recorded work as he passed away during the production of this album. Lead vocals on two of the ten tracks on this CD are performed by female artists. The first song "I Don't Want To Be With Nobody But You" is sung by Joan Osbourne. She gives the song a bluesy/r&b feel to the song. The other song sung by a female singer is "Slippin' Into Darkness" by Grammy Award winner Lisa Fischer. Her singing experieince gives this song a more pop/r&b flavor to it. Johnny Rzeznick, of the Goo Goo Dolls, does a "spot on" remake of U2's hit "All I Want Is You". The highlights of this album are the two instrumentals found in the middle of this CD. 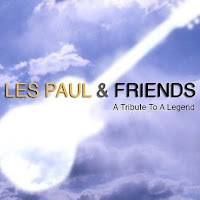 "69 Freedom Special" is performed by Les Paul "And Friends". Some of his friendsÊthat helpÊon the song are Hiram Bullock and Barry Goldstein. It also features a sax solo by Edgar Winter that only adds to the groove of the song. The other amazing instrumental on this tribute album is by well-known Gibson guitar player, Slash. His song entitled "Vocalise" is a slow bluesy ballad shows off his softer side. Slash and bassist Abram Laboriel, Sr. trade solos throughout the song. "I Love You More Than You'll Ever Know" is slow blues sung by Simply Red lead singer Mick Hucknall. It also features Joe Perry of Aerosmith on guitar. 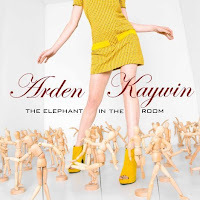 The final two songs of the album is a great cover of "How Long" featuring jazz guitarist Jeff Golub and a country-blues song "Great Hall of Fame". "Great Hall of Fame" has Richie Sambora (Bon Jovi) performing double-duties as lead singer and lead guitarist. This tribute album for 93 year old Les Paul shows the passion that these and other performing musicians have for the man and his instrument. This album is available now in stores and online. For more information, please check out http://www.lespaultribute.com/ and www.myspace.com/lespaultribute. 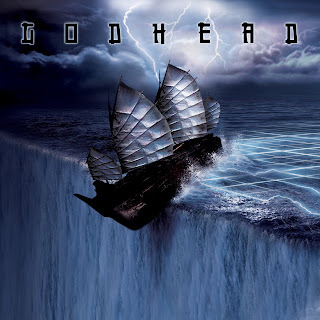 Godhead will be releasing their sixth studio album entitled "At The Edge Of The World". 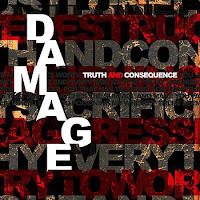 Lead singer, Jason C. Miller says that the band "reconnected with the influences that inspired us to write music, like The Cure, Black Sabbath, Bauhaus and even Rush." Originating in the mid-90's, Godhead have developed a following having toured with band like Marilyn Mason, Disturbed and Mudvayne They have also performed live on the 2001 Ozzfest tour. 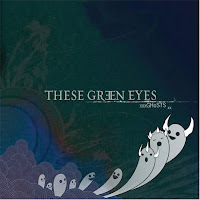 This album is their first release on the Driven Music Group label owned by ex-Korn guitarist Brian "Head" Welch. The opening song, "The Puppet" is a very drum-heavy song with a very melodic guitar riff that repeats throughout the song. The chorus is the only chance for singer Jason C. Miller to take control. The songs, "Stay Back", the first single from the new album, and "Just Take Anything" really shows what this band is capable of. With a powerful duel guitar attack and memorable chorus, these songs should open up the band to a much larger fan base. The songs "Hero", "The Decline", "Edge Of The World", "Closing The Door" and "Soldier's Song" all follow this winning formula. Ty Smith's drumming provides the energy, while Ullrich Heppelin' s bass keeps the songs a track. Michael Miller's guitar gives the songs their "heavy metal" edge as displayed on the song "Consumption". "Become The Sky" is highlighted by Ullrich's programming, but takes away the feel from the real instrumentation. The song "And Ever" brings the heaviness back with it's pulsing bass and monotone lyrics. "The Origin Of Suffering" starts out differently from any other song on the album. With highlights of violins and piano, the song gives a very mellow vibe to the end of the album. The production of this album puts the music out front and makes it shine, but leaves the singing behind. In addition to the 13 original tracks, album also contains five remixes of songs from the album. I'm glad the mixes were included, but they seem to take away from the "hard rock" feeling of the album. Maybe a separate disc of mixes would have been better. This album will be released on October 7. If you would like more information, go to www.godhead.com. A recent trend is for bands that have broken-up, whether over arguments or creative differences, is to reunite for world tours and even new albums. The members of Cream (Eric Clapton, Jack Bruce, Ginger Baker) reunited in 2005 and sold-out shows anywhere and everywhere they played. Motley Crue reunited a few years ago to have one of the most successful tours of their career and have also recently released one of their best new albums in over a decade. More recently, The Police and Genesis successfully reunited to have a couple of the biggest selling tours of all-time. Even the “boy band” New Kids On The Block reunited to release a new album and do a world tour. While these are just some examples of the success of reunited bands, they are not the ones I’m waiting for to reunite. 5. The Kinks - They have some of the biggest selling, most well-known rock songs in music history. They were inducted into the Rock & Roll hall of Fame in 1990. Ray Davies is one of the most successful songwriters in history. I was lucky enough to see them perform live in 1995 at the “old” Oakdale. It was one of the most innovative shows I have ever seen. While most of the members of The Kinks are in their late 60’s, they are one of the only bands from the 60’s that still have all of their original members still alive. The only thing stopping this reunion is the health and well-being of guitarist Dave Davies, who suffered a stroke in 2005. But next year, 2009 will be the 45th anniversary of their breakthrough hit, “You Really Got Me”. A perfect reason to reunite. 4. Guns N Roses - The original members of Guns N’ Roses have not performed together since 1990. Their debut album (Appetite For Destruction) has sold over 23 million copies and has since celebrated its 20th anniversary since being released in 1988. Right now, the time is right for a reunion. First off, nobody knows exactly who is currently in Guns N’ Roses. Secondly, Velvet Revolver members Slash, Duff McKagen, and Matt Soren (all formally of Guns N’ Roses) are currently looking for a new lead singer following the departure of Scott Weiland. Slash has been quoted as stating his his book that Guns N’ Roses have never been the same since Steven Adler and Izzy Stradlin left the band. I say they put their differences aside and give it try. They could easily become one of the biggest bands in the world. It might also help fans forget about if the album “Chinese Democracy” ever will be released. 3. Phish - When Phish disbanded back in 2004, a huge void was left in the jam band community. After Jerry Garcia passed away in 1995 and the Grateful Dead went their separate ways, Phish was there to take over the reigns. But, now that there is no Phish, the jam band community has been without a flagship band. Phish was one of the most innovative, experimental bands to to ever perform live. At some of their shows, they would play a single song for an hour, non-stop, intertwining other songs within their jamming on stage. It was a great thing to be a part of. Plus, you never knew what songs they would play, each night, each show was different. 2. Pink Floyd - The original members (minus Syd Barrett) have not played together since 1981, that was until 2005’s Live 8 show. The band reunited for 4 songs, hugged and then left the stage. It also left their fans wanting more. Now, with the recent passing of founding member Rick Wright, I feel that a possibility of a reunion tour has also died. In the near future, I think that the remaining members will reunite, at least one more time, to pay tribute to one of their own. The same way that Paul McCartney and Ringo Starr reunited to pay tribute to George Harrison. I hope that they realize, in the words of Roger Waters, that “Time is short”. 1. Led Zeppelin - Since last year’s reunion show in London, rumors have been swirling about a reunion tour. The latest news is that guitarist Jimmy Page, bassist John Paul Jones and drummer Jason Bonham (John Bonham’s son) have been jamming in the studio. But Jimmy Page has stated that for a proper reunion, you need all four guys. Which means the only member we are waiting on is lead singer Robert Plant. He has said that a reunion tour is not out of the question, but it won’t happen any time soon. So, Led Zeppelin fans, don’t hold your breath, just be optamistic for a future tour.